This doublet opal pendant has bright red, green & blue colours , this opal has that magical way of changing colours as the light catches them. The pendant measures 23mm in entire length with the opal alone measuring 14mm long, 10mm wide and is set with anti tarnish sterling silver. 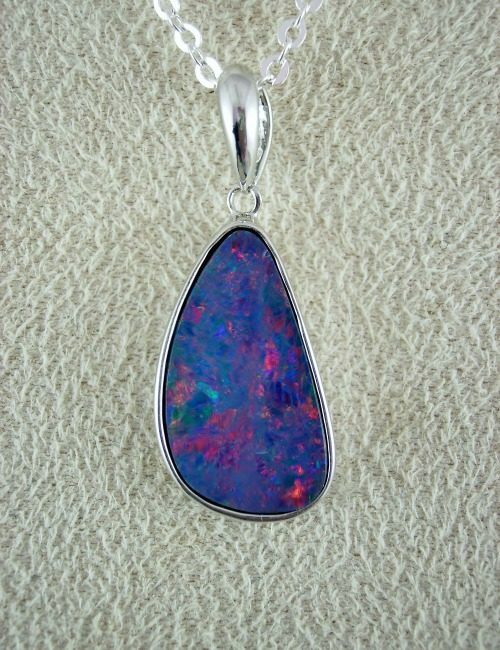 A gorgeous pendant with doublet opal set in anti tarnish sterling silver. The opal glows with deep electric blue colours and measures 12mm x 7mm with the pendant measuring 21mm long in entire length. 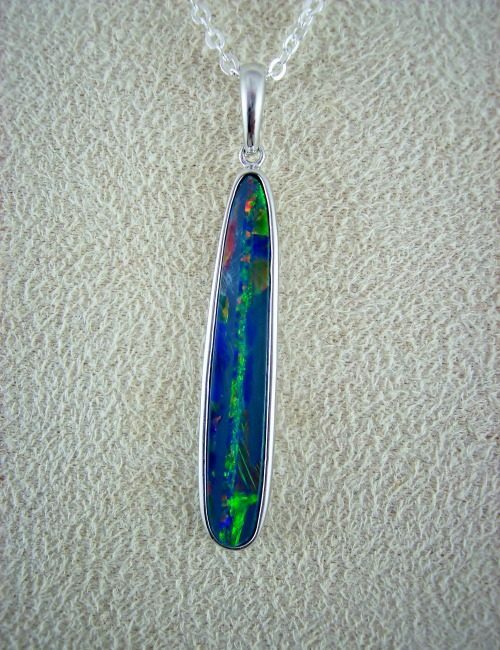 This doublet opal pendant has deep yet bright blue green colours. The pendant is set with anti tarnish sterling silver and measures 22mm in entire length, with the opal alone measuring 11mm x 6mm. 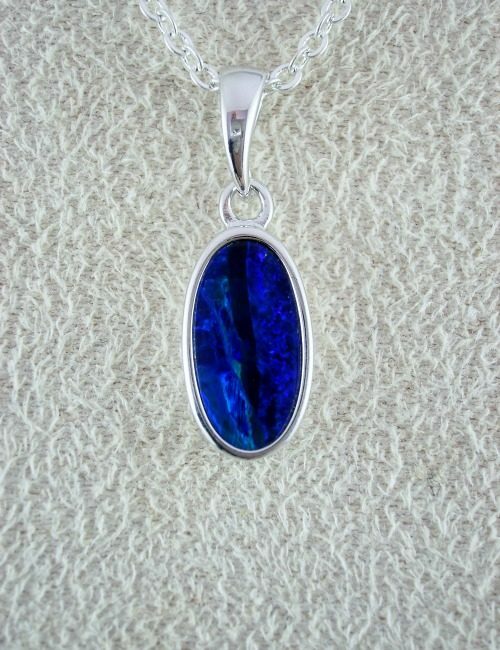 This doublet opal pendant has gorgeous bright blue green colours. The pendant is set with anti tarnish sterling silver and measures 22mm in entire length, with the opal alone measuring 12mm x 8mm. 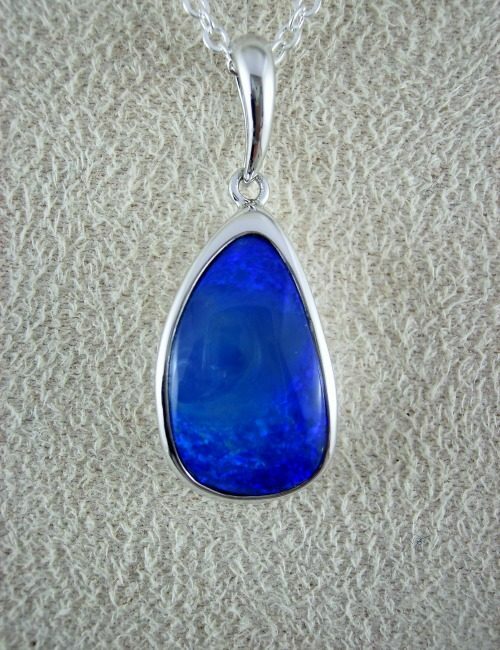 This eye catching doublet opal pendant has brilliantly flashing electric blue colour, it is set in a unique design with anti tarnish sterling silver. The pendant measures 17mm in entire length, with the opal alone measuring 9mm x 11mm. This doublet opal pendant shimmers with bright glittery turquoise colours. The pendant measures 33mm in entire length with the opal alone measuring 24mm long, 16mm wide and is set with anti tarnish sterling silver. 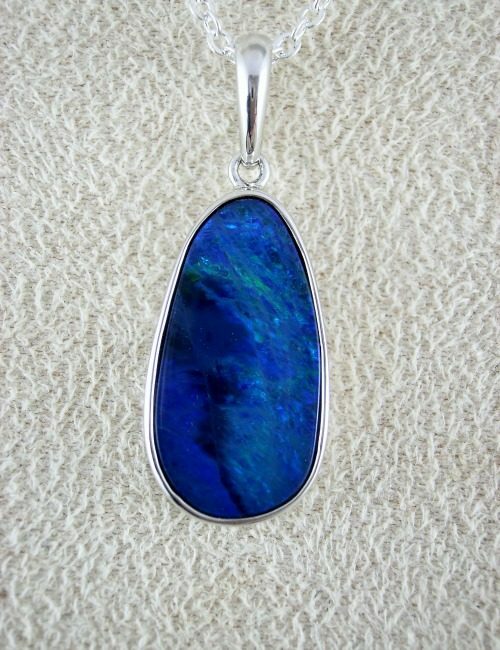 This doublet opal pendant glows with blue, green, gold and a touch of red colours, there is a lot of depth to the colours, they shimmer and glint the variety of colours as the light catches them. The pendant measures 30mm in entire length with the opal alone measuring 21mm long, 8mm wide and is set with anti tarnish sterling silver. This doublet opal pendant has shimmery green and blue colours, the opal has that magical way of changing colours as the light catches it. The pendant measures 30mm in entire length with the opal alone measuring 20mm long, 10mm wide and is set with anti tarnish sterling silver. 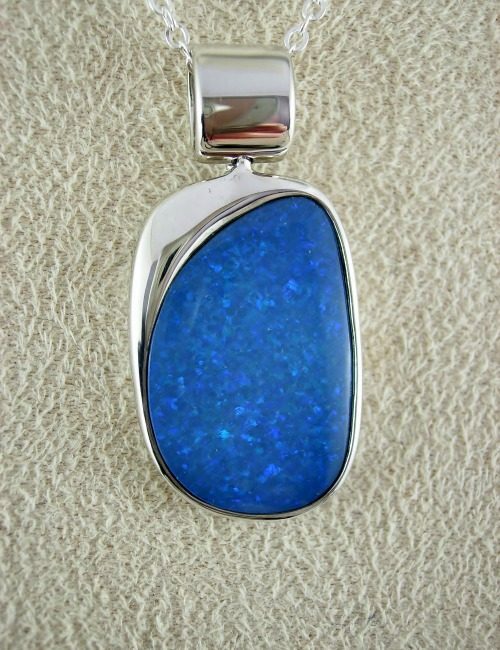 This doublet opal pendant has gorgeous bright blue colours that glow as the light catches them. The pendant has a naturally rounded surface and measures 30mm in entire length with the opal alone measuring 17mm long, 10 mm at the widest and is set with anti tarnish sterling silver. This doublet opal pendant has blue and green colours that sparkle and shimmer as the light catches them. The pendant measures 40mm in entire length with the opal alone measuring 30mm long, 6mm at the widest and is set with anti tarnish sterling silver. This doublet opal pendant glows with green, gold, blue and red colours, the opal has that magical way of changing colours as the light catches it. The pendant measures 45mm in entire length with the opal alone measuring 35mm long, 6mm wide and is set with anti tarnish sterling silver. This doublet opal pendant has brilliant red, pink and blue colours with a shimmer of green, the opal has that magical way of changing colours as the light catches it. The pendant measures 29mm in entire length with the opal alone measuring 18mm long, 10mm wide and is set with anti tarnish sterling silver. This pendant features one of our latest distinctive designs with brightly coloured doublet opal in highly polished hammered sterling silver. 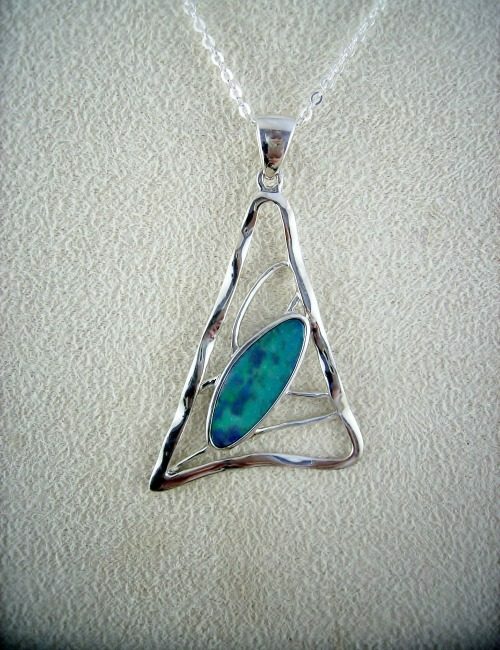 The triangle framed pendant has a freeform shaped shimmery green opal. The pendant measures 52mm in entire length, and 33mm at the widest point. As with all our silver settings, the sterling silver has an anti tarnish finish, just adding to the quality and wearability of the piece. This doublet opal pendant has bright red & blue colours with a shimmer of green, the opal has that magical way of changing colours as the light catches them. The pendant measures 23mm in entire length with the opal alone measuring 12mm long, 6mm wide and is set with anti tarnish sterling silver. This stunning doublet opal pendant sparkles and glows with brilliant green, orange and gold opal colours. The pendant is set with solid 9ct yellow gold and measures 18mm in entire length with the opal alone measuring 10mm long, 8mm at the widest. 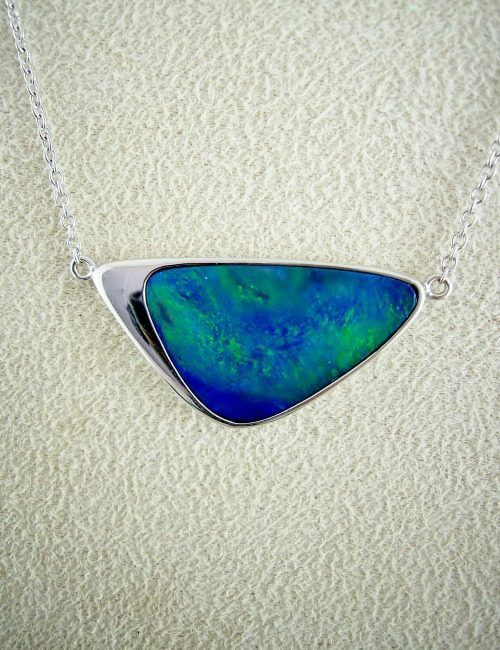 This doublet opal has glowing turquoise green and blue colours, it has been set with a surround of anti tarnish sterling silver with the chain attached to complete the necklace. 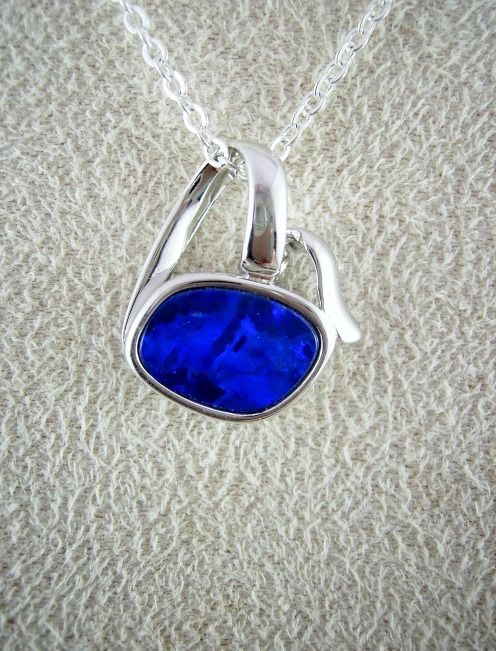 The opal pendant measures 33mm wide , 17mm long, the entire necklace measures 45cm including the attached chain. This freeform doublet opal sparkles with gorgeous multiple colours ....blue, gold , pink and green opal colours; it has been set in a flowing design with rose gold plate with a sparkling cubic zirconia detail. The pendant measures 20mm in entire length, with the opal alone measuring 8mm long, 13mm wide.